Description: Sky Meadows State Park boasts of a network of 12 miles of trails. They are all well maintained and signed. Just like the shorter version, much of this 8.3 -8.5 mile moderate loop meanders across or skirts the edges of rolling meadows offering up to 4 vistas along the way. 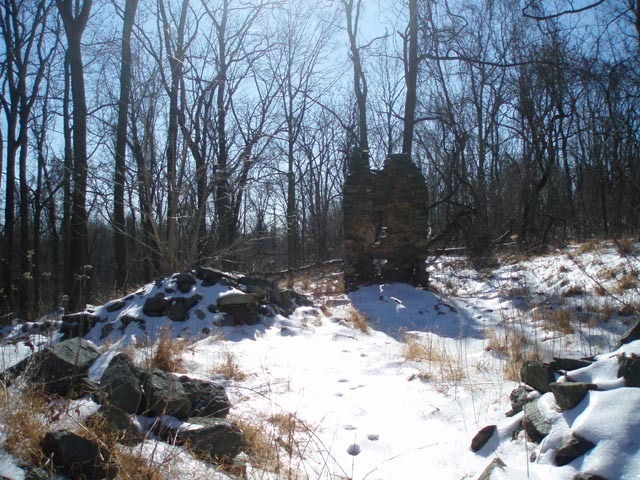 This hike includes the Snowden Interpretive Trail and the Old Trail (Old AT). You can customize it to your liking by dropping and adding trails as you wish and changing directions. This is a great place to take the family! Note that there is a $4.00 entrance fee paid on the honor system at the entrance. Leash rules are strictly enforced. 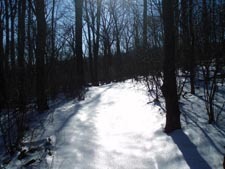 The hardest part of the 1600 feet of elevation gain is accomplished early on as you climb the South Ridge Trail and then the North Ridge Trail. More information and history of the park can be found here. 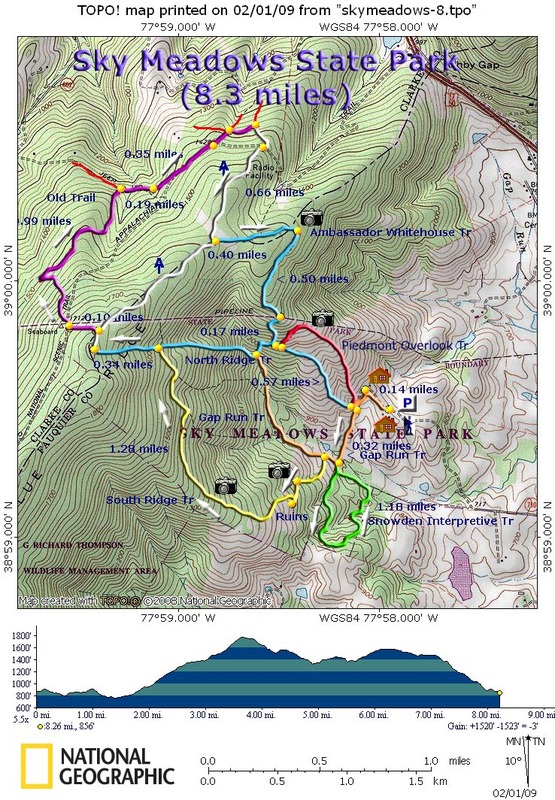 Trail Notes: This hike begins at the Mt. Bleak House parking lot. (A visitor center with bathrooms is behind it.) Walk down the road to a large kiosk and follow the footpath to an old dirt road. This is orange blazed Gap Run Tr. Turn left here, soon passing the turnoff for the North Ridge and Piedmont Overlook Trails on the right. This is your return route. Continue straight on the Gap Run Tr catching pastoral views to either side of the road. In 0.32 miles the green blazed Snowden Interpretive Tr is straight ahead. 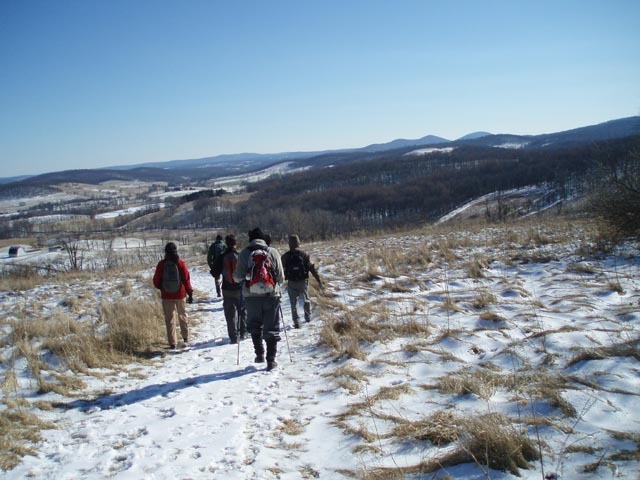 to do the hike as described continue straight on the Interpretive trail and complete the 1.18 mile loop. When you return to the Gap Run Tr you want to turn left here to continue on the Gap Run Tr. In a few steps turn left onto the yellow blazed South Ridge Tr. In 0.19 miles arrive at a pleasant northerly vista. To continue the hike descend slightly into the woods and ascend again to yet another meadow. 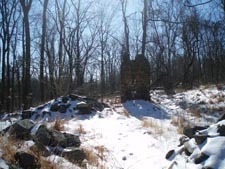 You will pass the ruins of the Snowden House which was destroyed by fire in 1913 along the way. Above the ruins you will follow the edge of another meadow offering a southerly panoramic view. In 1.42 miles from the first vista arrive at the junction with the North Ridge Tr. Turn left here and climb steeply up a rocky but short trail to the AT. Turn right and soon turn left onto the purple blazed Old Tr. You will parallel a gas pipeline as you descend to an old woods road. Turn right onto the road, cross the gas pipeline and turn left onto a purple blazed footpath just before a gate. In 0.99 miles an old jeep trail comes in from the left. Continue to follow the purple blazes. In another 0.19 miles you will join a wider road. Keep a watchful eye. In another 0.35 miles the trail will leave the road to the left on a footpath. Soon arrive at a 4-way intersection. Turn right, following the double purple blaze and climb to the AT. Turn right onto it, cross an old woods road and in 0.66 miles arrive at the blue blazed Ambassador Whitehouse Tr. Turn left Ambassador Whitehouse Tr. (Ambassador Whitehouse was the Ambassador to Vietnam during that war.) In 0.40 miles arrive at the Paris View. Continue on and descend to the pipeline in another 0.52 miles. Pass through the horse gate. The trail turns right (uphill) for a few steps before turning left into the woods. Descend to the junction of blue blazed North Ridge Tr. Turn left here but in a few yards arrive at the junction of the Piedmont Overlook Tr. This hike has you proceeding on the North Ridge Tr (but you could turn left here and visit the fourth and final vista. The difference is about the same either way.) Continuing on the North Ridge trail for another 0.57 miles you will cross a fence using a set of stairs. As you approach the Gap Run Trail you'll cross a fence with one more set of stairs. (Cows don't do stairs. Descend on a set of stone steeps and turn left on the Gap Run Tr. Retrace your initial steps back to the car.